I need to remember that there is always a story behind the food. Sometimes as food bloggers, we often get stumped about what to write about. I mean honestly, what in the world does my dog Hula have to do with French onion soup? Well everything, because she is just awesome, but that’s besides the point. There is a reason we want to make a recipe and crave its flavors, cook over the stove for hours and then wait as our mouth waters clicking away on our camera . And it’s pretty simple…food is awesome. And people love you because you love food. That’s it. For instance, how many recipes can you Google for French onion soup? Oh..just about a million..probably a billion! But is that going to stop me from making this snuggly-tummy soup? Heck no! It tastes freakin’ awesome and I want to see Joe’s mom swoop this down in 2 bites. Which totally happens. She is the LFK guinea pig and we always bring her the leftovers and “mistakes”. Do you remember when I was testing mango margaritas for my grad party. Ya…we won’t go there. So let’s get to business. I like to call this “Not so classic” French Onion Soup because I didn’t follow Julia’s recipe, even though I intended to. Instead I used what I had on hand and topped this French soup with Jewish challah bread, because why not..I’m all about cultures. I also added some fresh thyme which I think really brightens up the deep soup flavor. 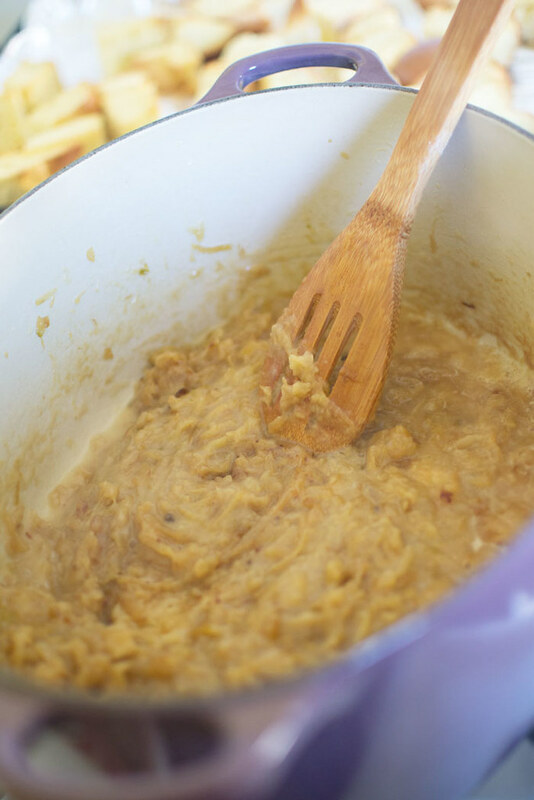 1) In a large and wide pot, melt butter and oil together and add all of your onions. 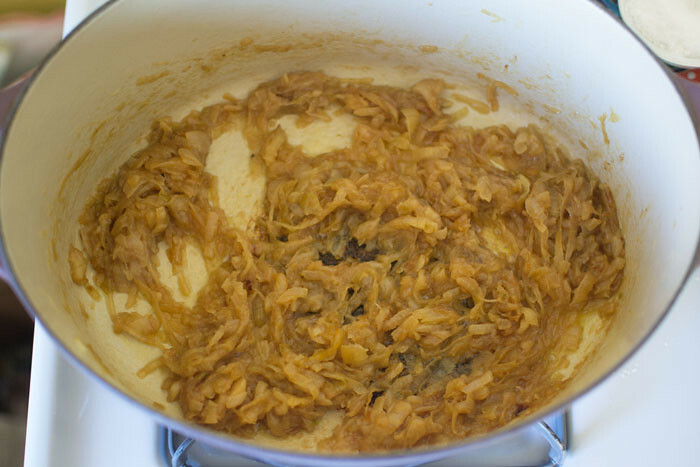 2) Cover pot and cook onions on medium heat for 15-20 minutes until they begin to break down and caramelize. Then take the cover off and add sugar and salt. Stir in and continue to cook the onions, stirring them every few minutes until the onions continue to break down and caramelize. 3) Once onions are a deep brown color, add flour and fresh thyme and stir it in. The onions will get thicker and make sure you cook the flour off. 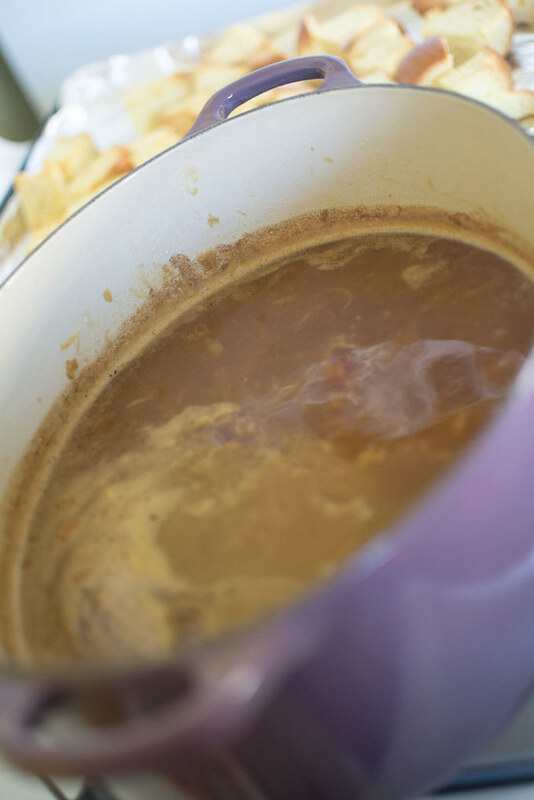 4) Add the white wine and allow to cook until wine reduces, about 2-3 minutes and then add your beef stock and mix well. Allow to cook on a gentle simmer for an additional 20 minutes. Season with salt and pepper and adjust seasoning as needed. 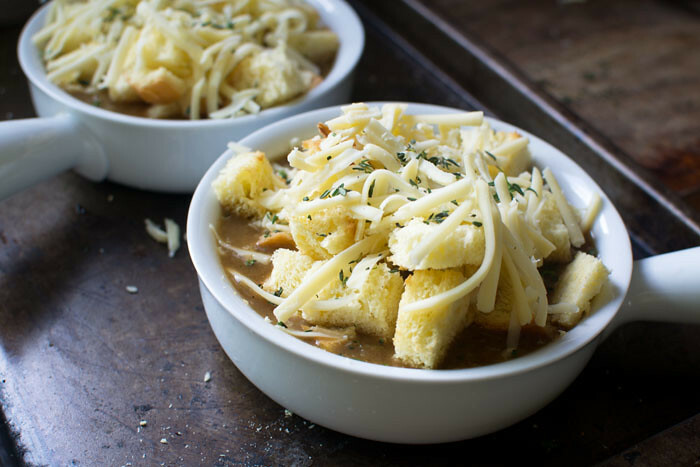 5) When ready, ladle soup into oven safe soup pots and top with toasted bread and shredded cheese. Place soup bowls on a baking sheet and bake in 400 degree F oven for about 10 minutes or until the cheese melts. The soup makes a lot, however I only made enough toppings for about 2 servings. Adjust cheese and bread as needed. 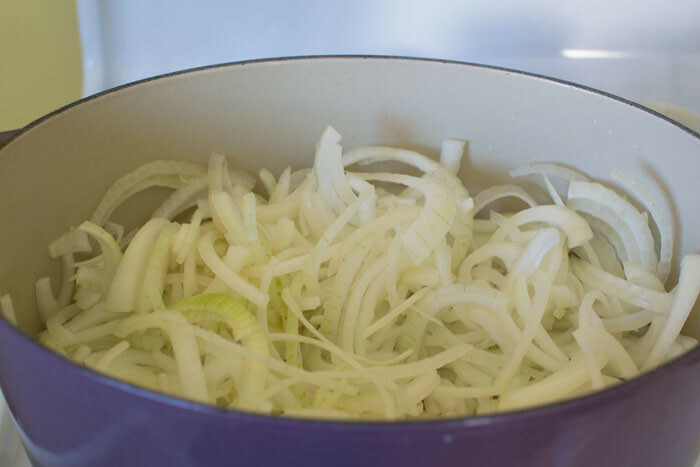 In a large and wide pot, melt butter and oil together and add all of your onions. Cover pot and cook onions on medium heat for 15-20 minutes until they begin to break down and caramelize. Then take the cover off and add sugar and salt. Stir in and continue to cook the onions, stirring them every few minutes until the onions continue to break down and caramelize. Once onions are a deep brown color, add flour and fresh thyme and stir it in. The onions will get thicker and make sure you cook the flour off. Add the white wine and allow to cook until wine reduces, about 2-3 minutes and then add your beef stock and mix well. Allow to cook on a gentle simmer for an additional 20 minutes. Season with salt and pepper and adjust seasoning as needed. 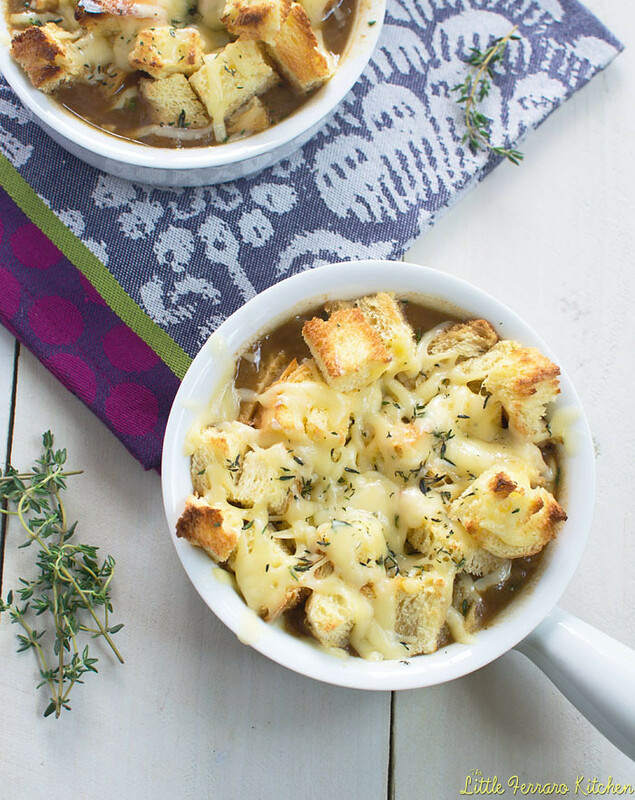 When ready, ladle soup into oven safe soup pots and top with toasted bread and shredded cheese. Place soup bowls on a baking sheet and bake in 400 degree F oven for about 10 minutes or until the cheese melts. Can this be made with chicken stock instead of beef stock? What other alternative to beef? By the way, I heard about your website on Leo Laporte KFI radio yesterday and think it’s a great site! Hi Moss! So glad I have a new reader! 🙂 Yes, certainly make it with chicken stock! It won’t be as “rich” as the beef but the flavor will still be gorgeous! Let me know how it turns out. I wish I could be your recipe tester, Sam! 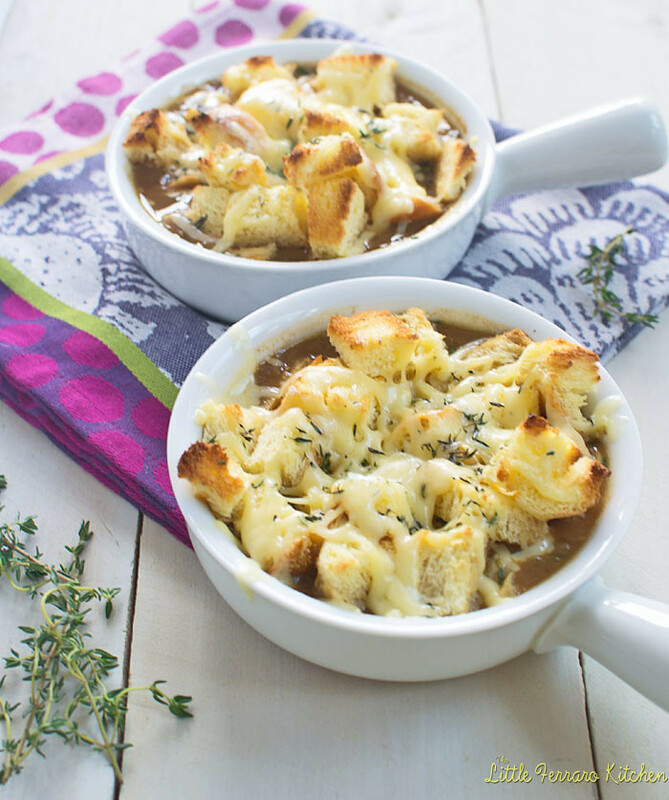 This french onion soup looks amazing! Sticking to the classics is fine but I also love vamping the recipe to modernize it a bit. 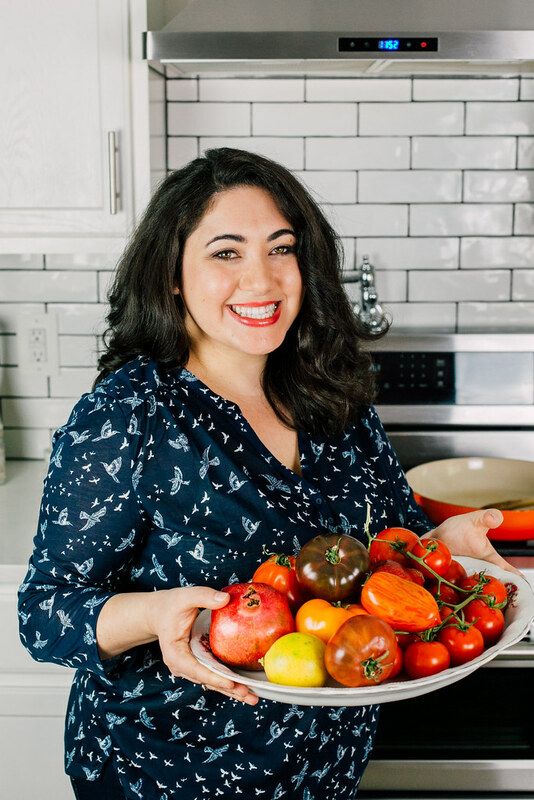 Your changes sound delicious (I love thyme) and you certainly can’t go wrong with delicious challah bread. I love your photos, girl! And bring on the Hula stories and photos. I can never get enough of your adorable dog. Thanks Nancy!! And thanks for the photo compliments..always practicing! And I LOVEEE seeing your little guy too!!! This looks so so so tasty! I cannot get enough challah bread, so I love that it’s used in this recipe. Yum! So what does Hula have to do with french onion soup apart from being awesome. That said the soup looks delicious and very easy to make.